Over years, the technology that is employed to build safety shoes has improved at an astronomical pace. The technology along with intelligently picked materials not only ensure safety shoes and work boots that withstand the toughest of work conditions, but also enable the safety shoe companies in India to meet the domestic as well as global demands for Indian Safety Shoes. Liberty is one of the frontrunners in safety shoe manufacturing and supplying in India; its Warrior line of products caters to workers and professionals working across industries, both in India and several other countries. So, what is it that makes safety shoes so much popular, in fact mandatory, across industries? If you or your workers work on sites where they carry heavy objects or where people, machines and vehicles tend to work at the same time, injuries from falling and /or flying objects are common things. Equipping your feet with the fine leather industrial safety shoes is probably the best thing you can do to stay away from such common hazards. While working on a construction site, it is very much possible that you step on a sharp object or the object gets stuck on to your feet from above. 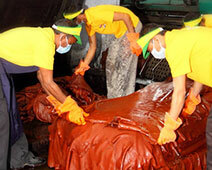 In such a scenario, safety footwear with heavy-duty soles and tough materials help a lot. Electrical accidents can be fatal to your life. And therefore, if you work in a factory / plant / or industry where electrical hazards are common, protect yourself with safety footwear that offers protection against electrical shocks. In locations, where the build-up of static on the body poses a threat to your safety, make sure you wear anti-static or conducive safety shoes and work boots. 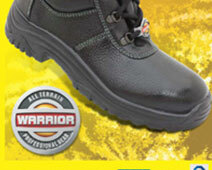 Safety shoes are usually not very costly. But then, the price should not be the basis of your selection of a pair of safety shoes. When buying or placing an order for these shoes, make sure you are buying the best quality shoes that you can afford.